With over 40 vineyards offering incredible tasting tours of Western Australia’s most exquisite wine, Swan Valley is a must for wine connoisseurs. 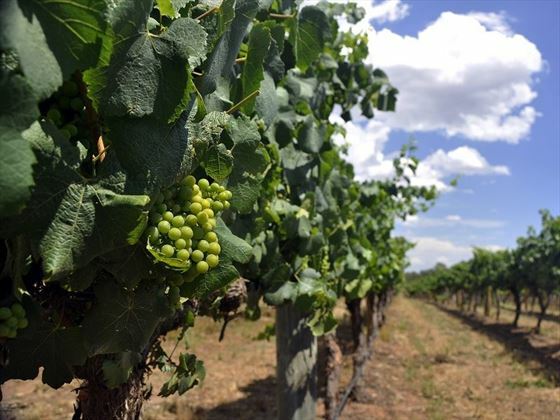 With verdant vineyards and wineries sweeping across the rolling hills and creating a wash of vibrant green, Swan Valley is arguably one of the most beautiful areas of Western Australia, painting the perfect backdrop for an afternoon of tasting decadent wines and teaming them with gourmet cuisine. Swan Valley Tours offers a true insight into the area’s cultural heritage, enriching every sip with wonderful information about its background and significance. There are many excellent wine tasting tours on offer, via cruise or minibus, but our favourite at Tropical Sky has to be the Afternoon Delights Coach Tour. Taking you to three wineries, a brewery and a chocolate factory, a day on this tour will certainly leave you feeling full and satisfied. The tour starts at 12.30pm, your friendly tour guide greeting you at Perth City Bush Station before venturing towards Swan Valley and stopping at your first port of call – Houghton Winery. Well renowned as the place legendary outlaw Moondyne Joe was captured in 1869, this beautiful winery has a wonderfully welcoming atmosphere, surrounded by a scenic picnic area and restaurant. After wondering around the spacious, luscious grounds you’ll come across your first wine tasting counter, a decadent collection of six wines ranging from dry to sweet. Rosy cheeked and ready for more exploring, you’ll then saunter along to Windy Creek Estate, a winery where produce is only made from the fruit grown on the estate itself. This natural, sustainable edge makes this one of the more unique wineries, with a charming cellar door that looks out onto the vineyards. Before tasting your first glass, you’ll be presented with a delicious selection of cheeses, relishes, jams and marmalades to tuck in to, and a chance to enjoy the sunshine beating down onto the yard. From Chardonnay and Classic Dry White, to Family Reserve Shiraz and Caprice, the wines here marry beautifully with the gourmet treats on offer. The next stop, Mash Brewery, is much more lively, with a friendly atmosphere and a wide range of beers and ales. Here you’ll be entitled to one free beer each – but at Australian Sky we would recommend all buying a different beer or ale each; it means you can sample more! Pale lager, pale ale, wheat beer…there’s a frothy drink for everyone here. Ready for something sweet? The last stop on this gastronomic tour is the Margaret River Chocolate Company, an indulgent and award winning chocolatier offering a divine sample of dark, white and milk chocolate. You’re even welcome to go back to the chocolate pots as many times as you can handle – the perfect finish to a decadent day. Be sure to head into the gift shop and stock up on the factory’s wide variety of chocolate in all shapes, sizes and flavours – perfect for a tasty souvenir. Our team love embarking on this tour whilst exploring Western Australia, especially due to the quality food and drink on offer all throughout the day.